All music compositions at Lance Delgado Music fall into 1 of 3 categories: Beginning, Intermediate and Advanced. It is of utmost importance that each line is playing music that is appropriate to their ability level. 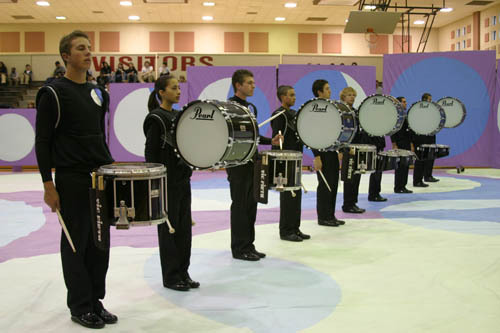 Beginning - This music is designed for the drumline with little or no experience. It could be a new program just starting out, or possibly the group is made up primarily of non-percussionists. The instructor might be new to teaching, or perhaps there might not be a percussion instructor at all. It could even be a middle school, or an elementary school. Intermediate - Most groups fall into this category. This is the drumline with some experience and ability. There is usually at least 1 percussion instructor. The ability level might vary from section to section. The group might have some winter/indoor experience. Advanced - This is the very experienced group with lots of ability. It could perhaps be a drum corps, college or very successful high school program. These groups usually have WGI/DCI/BOA/ experience and success. These are "battery only" compositions that may be used for parades, football games or entering/exiting the field. These are "battery only" compositions that may be used as a "1-minute warm up" on the field prior to a performance.